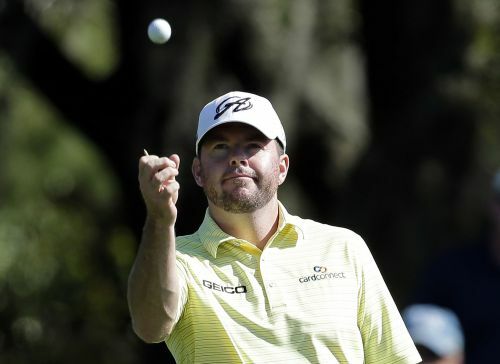 PALM HARBOR, Fla. (AP) — Robert Garrigus became the first PGA Tour player suspended for a drug of abuse, saying on Twitter that he had a relapse with marijuana. The tour announced Friday that the 41-year-old Garrigus, whose only PGA Tour victory was at Disney at the end of the 2010 season, has been suspended for three months under the conduct policy that applies to substances of abuse. While marijuana is legal in some states, it is on the banned substance list under the PGA Tour's anti-doping policy. Garrigus has spoken openly about his history of addictions, which began before he reached the PGA Tour. He checked himself into a 30-day program at Calvary Ranch near San Diego in 2003 and said, "I spent 30 days to change the rest of my life." He made it to the PGA Tour in 2006 and had his most consistent year in 2012, when he had four runner-up finishes, made it to the Tour Championship for the only time and cracked the top 40 in the world ranking by the end of the year. In his Twitter message , Garrigus apologized to his family, fans and sponsors and said he hopes he can make it up to them. "After a long period of sobriety, I had a relapse and subsequently failed a drug test for marijuana," Garrigus said. He says he pointed out that marijuana is legal in many states not to make an excuse, but as a warning. "Legal doesn't meant it isn't addictive and legal doesn't mean there aren't potentially severe consequences if you use it," he said. "I will use this time away from golf to be with my family and work on regaining my sobriety. It doesn't matter if you are one day, one week or nine years clean; one misstep, one lapse in judgment can impact your life in monumental fashion. "I hope this new chapter in my life will now show people to never relax in their battle with addiction." Garrigus, who is married with two sons, finished 131st in the FedEx Cup last year and was playing this year on conditional status. He has played four times this year, missing the cut in three of them and tying for 64th in the Genesis Open. He last played a month ago in the Puerto Rico Open.